Find hotel near Floating Market Lembang B ..
An addition to the list of tourist attractions in Lembang is this beautiful Floating Market. The market has been specifically designed to attract tourism and has been replicated from the markets of Bangkok and north Sumatra langkat. The market is home to a vast number of items, from accessories, food, vegetables, fresh fish and much more. Shopping lovers will love a lot here as they will not only get the variety but witness the things authentic to Bandung. Not only that, visitors also get to buy a number of games like water boats, water trains and outbound to add more to your rendezvous. They also sell miniature railways that are cute and easily transportable. Ensure to buy a souvenir while you are here! To personalise your visit to the city, you can use an all-inclusive Bandung trip planner for the same that will give detailed information about visiting the city. Fine Accommodation options like Utc Bandung, Favehotel Braga and Hotel California Bandung will meet your requirement of where to stay in Bandung. 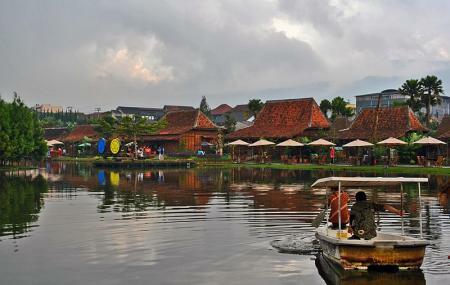 How popular is Floating Market Lembang Bandung? People normally club together Bandung Treetop Adventure Park and Bosscha Observatory while planning their visit to Floating Market Lembang Bandung. I've been 5 times visit this place and never get bored (2013-2019). A good maintenance from time to time. I think it is the best place for family. With a very wide area, start from parking area, various attraction for any age such as mini zoo, mini train (for kids), rainbow garden (instagramable spot), etc. You can exchange the entrance ticket with a cup of drink. Just like the name, floating market, you can try the sensation for having culinairy in the "floating design market" at the lake. The seller placed in boats. What i satisfied is about the price. There are so many snack and food with reasonable price. Moreover, some restaurant and souvenir market also have a good price. But, recently i found that it's very slippery in some areas during the rainy day. It is dangerous for the oldest. Watch your step then. Prepare the umbrella always.. Many types of indonesian dishes here and they're cheap. I love it..! But you have to buy tokens to purchase the food there. A great location for family outing as well. Floating market is located on a hill top, it has a beautiful lake and there are many vendors selling food and souvenirs in boats. This place has a large range of local food, souvenirs and tea/coffee. Best time to visit is when it is drizzling and everything starts to look more beautiful. There are a lot of activities for kids too. Entrance fees is 10,000 IDR which can be exchanged with tea, coffee or milo once you enter in floating market. This place is a family park consist of all many mini park inside there. Got place for kids, garden, and a food stalls like a floating market. To buy foods have to exchange to coins only where you can exchange through the coins counter. So many people during weekends. The place also huge, if you have kids better spend more time here approx 2-3hrs.